We do not share your information with any other source nor do we share mailing lists. Our order page is encrypted for your safety and privacy. We do not store your credit card information. Over time, we'll be putting together an extensive archive of "how to" projects and past newsletter editions. Please check back often to see what's new. If you would like to submit an article describing a particularly useful technique you have or how you've applied our products in the past, send it to the e-mail address that follows. Need more help? Look no further! Visit the KNet's online custom knife resource and rub elbows with the world of custom knife making enthusiast's on the web. From amateur to professional, if it's about custom knives ... it's at the KNet! We are proud to be founding members of this important internet community development. We support the future and integrity of the custom knife art form. Join us on the web today! 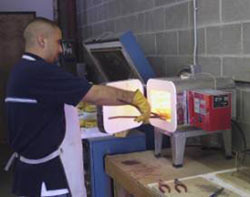 We offer the service of heat treating and tempering of handmade blades in our shop. This service is scheduled for every Tuesday (except on major holidays, in which case it will be done on the nearest full workday). Usually all blades are shipped out on the following Monday. We can do almost any air hardening material as long as we have the instructions or the customer sends them with the blades ( see helpful hints below ). Blades must be in our shop by Monday at 5:00 PM. Our intent is to give the customer a hard and tough blade that they will be happy with. We use custom built electric furnaces with digital controls. All air-hardening blades are double wrapped in stainless foil which eliminates most of the scale usually encountered in heat treating these items. The small amount of scale or discoloration is usually easily buffed off, but occasionally more scale is encountered and heavier buffing is required. Stock removal is hardly ever required. Our intent is to temper the blades to a Rockwell “C” hardness of 58 or 59. Folder springs will be tempered to 43-45 Rockwell “C” unless otherwise requested. We heat treat and temper only air quenchable steels such as 440C, 440V, 154CM, ATS34, D2, A2, etc. Please fill out our Heat treat and Cryo-form. To help ensure that we can offer the best and quickest service possible, we have some hints for you. Because we use atmospheric ovens and must wrap all the blades to protect them from discoloring and scaling, you can do some things to help keep your blades clean. Cleaning the blades with a good dish soap (Ivory, Dawn, etc.) will remove any oils or buffing residue and may help the blades come out cleaner. Also, do not put tape directly on the blade. Wrap several layers of newspaper and tape the outside. In regards to warpage, it is a good idea, when possible, to leave blades slightly oversized so in the very rare case of non-correctable warpage, material can be removed. Some factors that affect warpage are hollow ground edges, blades that are tapered in length, very thin blades, and blades that are not ground symmetrically. We endeavor to provide fast, professional, and friendly service and we view it as our honor that you choose us for such an important part of your knife making needs. We are offering Deep Cryogenic Tempering to blades along with our normal heat treating and tempering. This will add one day to the usual heat treating and tempering sequence. This service is also available for our factory finished blades. Deep Cryogenic Tempering is a one-time process that removes all of the retained austensite (large unstable particles of carbon carbide) from the steel and transforms it to martinsite. Edge holding properties are greatly enhanced by this process. When adding this service to heat treating & tempering, blades will be shipped out on Tuesday of the following week. We make every possible effort to give each blade the best combination of hardness and toughness that we can through the proper use of our equipment. However, if a blade is damaged due to our handling or equipment malfunction, our liability is limited to the replacement of an equal amount of the same steel used in the damaged item. Any further responsibility will not be accepted nor will we be responsible for warpage due to unequal grinding of the blade or item. We also reserve the right to refuse any blade that could have serious heat treating or warpage problems we could not correct. Please check blades with a magnet if you are unsure of stainless properties. Nonmagnetic stainless steel does not harden. Please fill out our Heat treat and Cryo-form located Here. Maximum overall length is 20”. Do not attach anything to blade that will melt below 2500 degrees F. Blades must be completely degreased. Please mark all blades. Please do not use Duct-tape on blades, but protect blade points from damage during shipping to us. For shipping and handling information, please see Heat treat and Cryo-form. How do I pay with PayPal? To send us payment using Paypal you need to go to www.paypal.com and login to your personal account. Select send money. When you are asked for recipient's email, then enter our PayPal email address sales@texasknife.com along with the total amount you will be paying. If you have any further questions please call us toll free at 888-461-8632. What is Cryogenic Quenching? In this process, the steel is frozen to a temperature below 300 degrees fahrenheit and tempered. After the Cryogenic process there is a permanent change in the metal grain structure eliminating impurities (retained Austenite) and a complete refinement of the grain structure of the steel. Cryogenic quenching results in an improvement in wear resistance and toughness resulting in greater edge holding. Does Cryogenic Quenching make the blade harder to sharpen or finish? No. There might be a slight change in hardness, but sharpening and other work on the blade will be the same. Are your blades heat treated, tempered and ready to use? Yes. All of our blades are sharpened, heat treated and tempered. What are scales, blocks, pieces and cylinders? Scales are the handle material on each side of full tang and folding knives. Our standard dimensions are: 1-1/2" wide x 5" long. The thickness varies. Pieces are larger dimension handle material. Our standard dimensions are: 5" wide x 12" long. The thickness varies. Blocks are handle materials used on hidden tang knives. Our standard dimensions are: 1-1/2" wide x 1-1/8" thick x 5" long. What if the holes in the blade are a little bit larger than the pins I want to use? You can use a little bit smaller pin diameter than the hole in the blade because the epoxy will fill the rest of the hole. How do I play a DVD on my computer? The DVD's for sale on this site are coded Region 1, meant for use in Region 1 DVD players. To play DVD's on your computer, you will need to download and install a third party DVD decoder. One option is the VLC media player (found at www.videolan.org); a free, open source, cross-platform media player for Windows, OSX, and Linux.